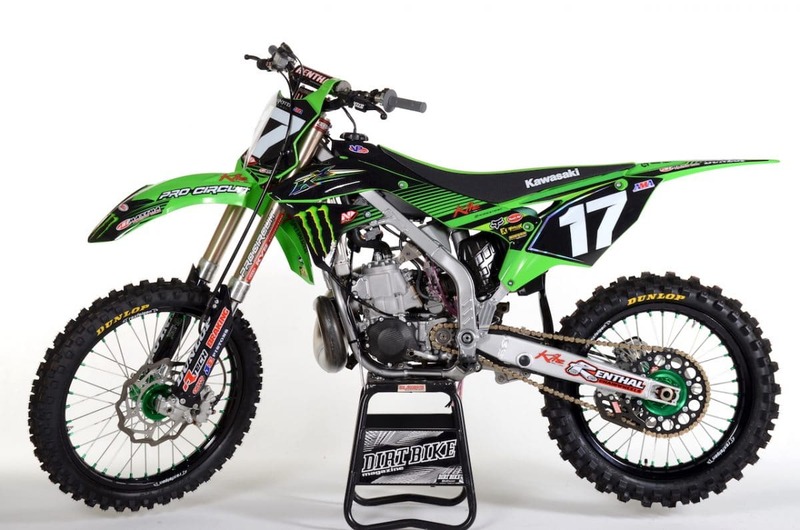 This week’s Two-Stroke Tuesday focuses on a immaculate KX250 with 2018 updates built by Pro Circuit Race Team mechanic Jon Primo. 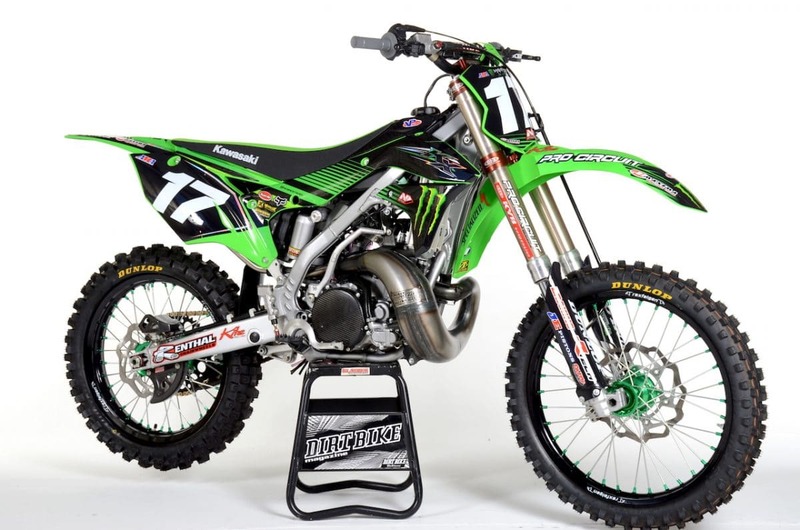 Products from Maxxis Tires and 707 Suspension are featured in the 2-Stroke Hardware section while 2-Stroke Theater has five different project bikes on display for your viewing pleasure. 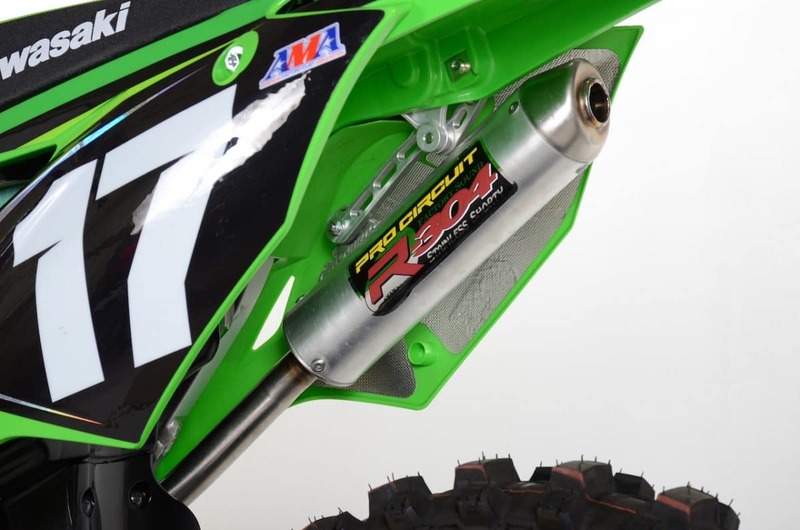 Don’t miss the exclusive link to our dual exhaust CR500 build at the bottom of this post. This is another machine built by Jon Primo that looks great in pictures but in person blows you away. The 2018 KXF plastic is mounted using a kit designed and built by Jon. Pro Circuit products are found all over this machine but the triple clamps are one of the items that everyone talks about. The carbon fiber clutch cover was made by Carbon Factory. This company was located in SoCal back in the mid 2000s but has since disappeared . If you find one of these buy it! The Pro Circuit Works pipe is still in there production lineup. The silencer bracket is machined out of billet aluminum and tucks the 304 unit up behind the new side panel almost perfect. 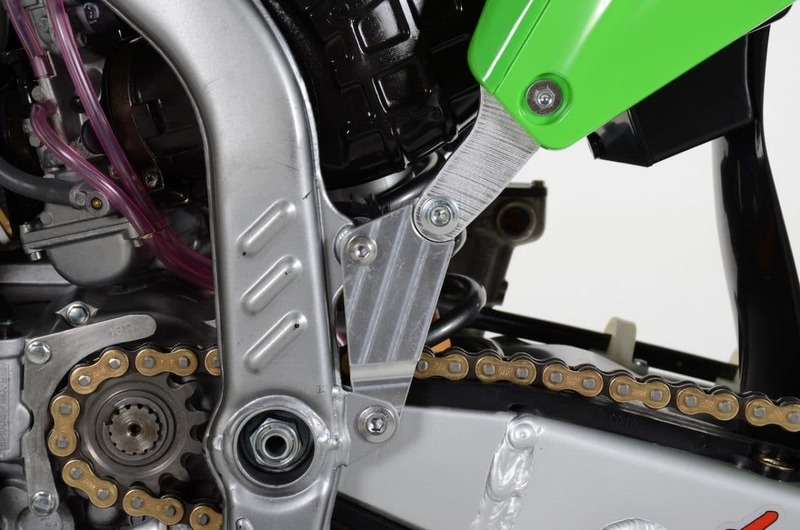 This is a close up of the lower subframe mount that allows the 2018 KX250F subframe to be used. The engine was completely rebuilt and Pro Circuit increased the performance with a cylinder port job. 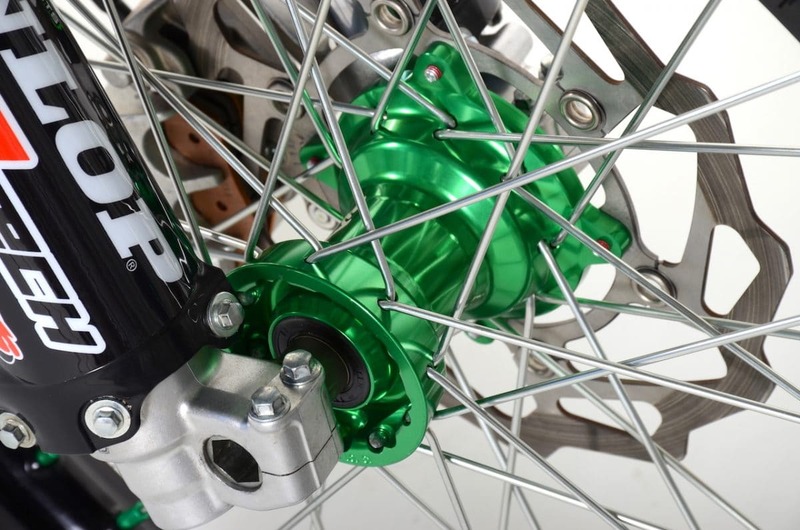 The green anodized Kite hubs not only make the build pop but they are lighter and stronger than the stock units. Oversized spokes with black rims wrapped in Dunlop MX3S tires were also added. Another billet piece that helps the newer plastics bolt up to the older two-stroke steel frame. 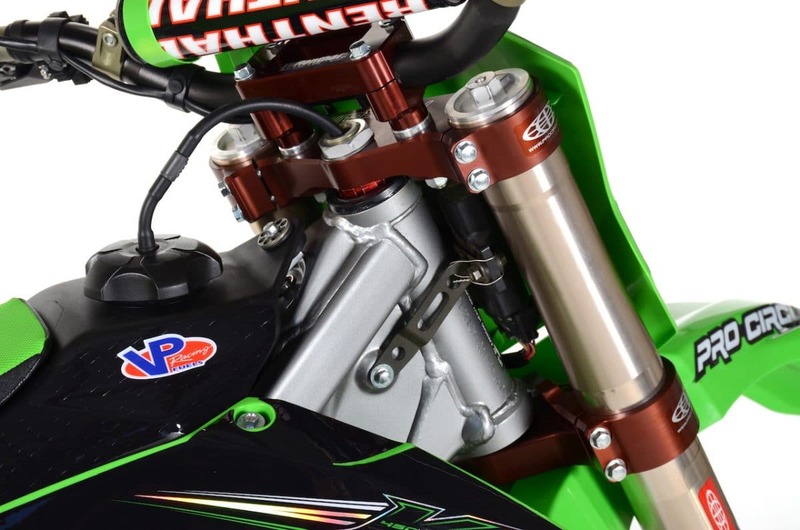 Who wouldn’t want a 2018 KX250 two-stroke? We like this machine so much that a couple more are in the process of being built right now. Stay tuned! 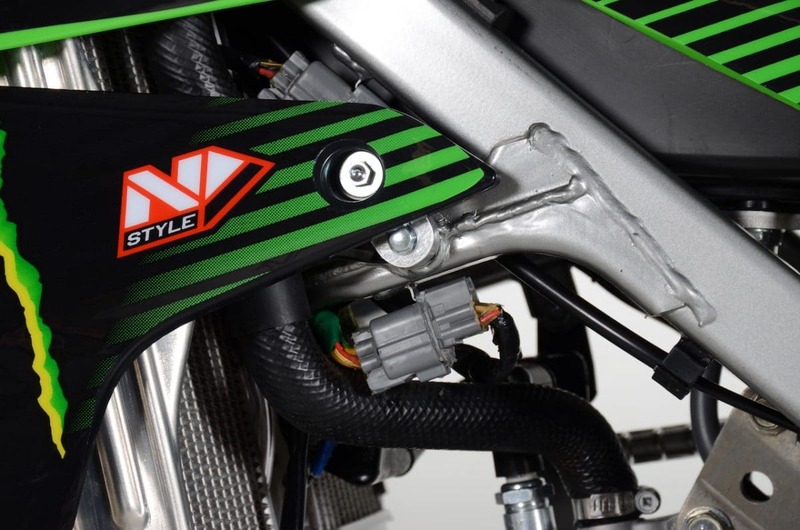 Designed specifically for motocross application and developed with feedback from seven time Supercross champion Jeremy McGrath. The new Maxxis MX-ST has an all new tread pattern, rubber compound and tire composition to improve stability, predictability and traction in a variety of motocross applications. Ask anyone that has changed seals on the 2003-19 WP 48mm fork how the snap rings looked. They will all say “Rusted”. 707 Suspension has a solution. 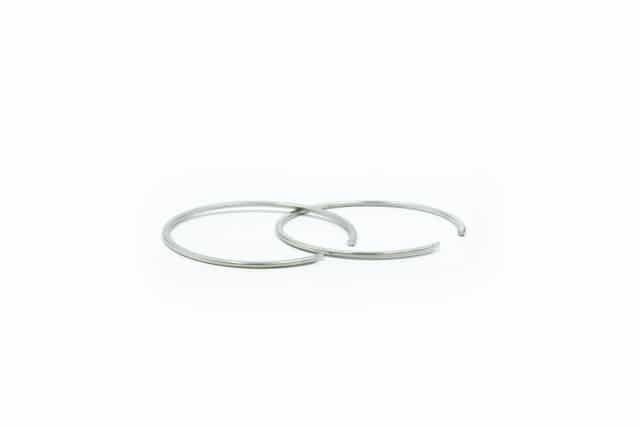 They designed stainless snap ring set that come backed by a lifetime guarantee and at a price that won’t hurt your pocket book. 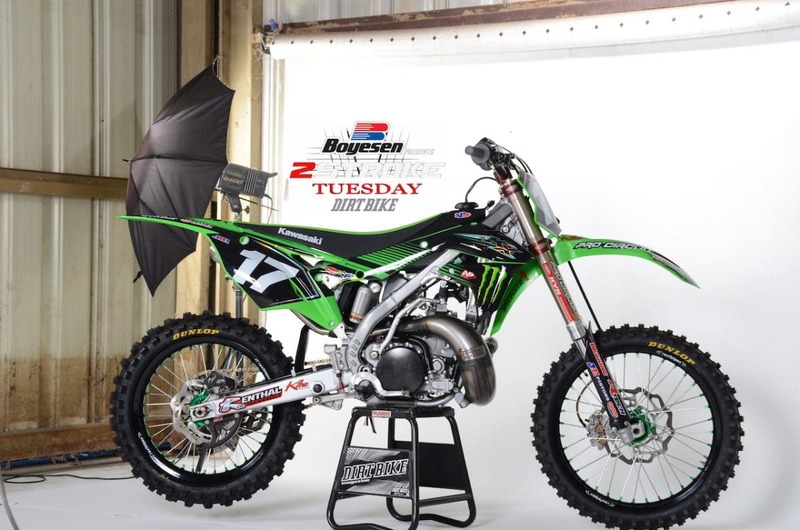 If you like the updated KX250 build featured on this week’s Two-Stroke Tuesday check out this AEO Powersports CR500. The build features a late ’90s CR500 engine in a highly modified 2017 CRF450R chassis. Click on the link or image below to see more.